Three-hundred and sixty five days ago I decided it was time to slap the “what if’s” in the face and start walking my own path. It was a hard decision, I remember the day clearly. After much debating and going back and forth on the pros and cons of moving forward with this decision and the possible consequences; at 5:46pm on July 15th 2016 I hit the “send” button on my corporate computer. 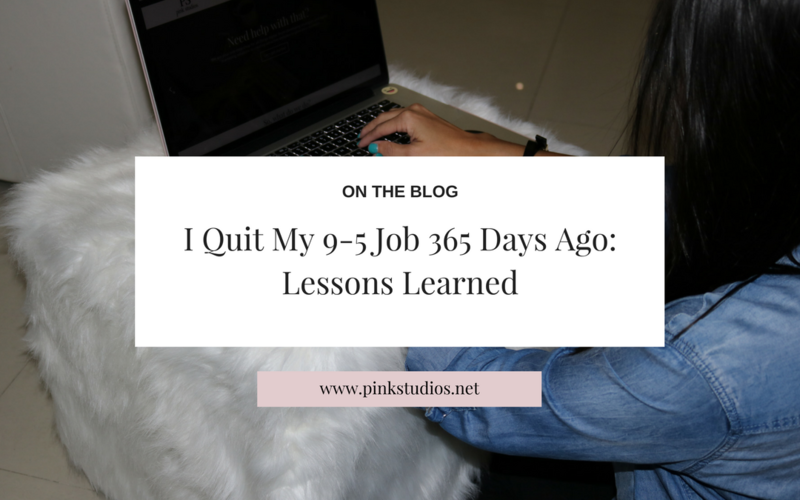 Going back to my decision of quitting my 9-5, the questions I often get asked are: “Did you have any clients lined up?” and “why did you quit?“. The answers are pretty simple: no, I did not have any clients lined up. At the moment, I hadn’t even reach out to my former clients to let them know I was available. The reason why? Disappointing others was the hardest part of this journey, however, after thoroughly analyzing the pros and cons and what my life could be if I went ahead with this decision, the amount of trust I had in myself and my abilities were just much greater. Take a chance. You never know how perfect something might turn out to be. What would I say to the 9-5 version of me? I would say the same thing I would have told myself after graduating college and that I shared with ambinity: here. If you never take risks you will never know if your dreams could become your lifestyle. Better an “oops” than a “what if”. What have I accomplished and learned these past 365 days as a full-time business owner? Took a well-deserved break. Burn-out is a serious deal; and in order to recharge I needed to work less, relax more and do nothing for a while. It felt amazing and it was exactly what I needed right then and there. Reconnected with myself. Creativity was running low as life had evolved into routines that did not promote creativity. Reconnected with my family and friends. Old routines had me 100% focused on one thing and were making me distance myself from loved ones. Although I cannot say that I am the best at this right now; I am able to admit that I am making conscious efforts to correct this and I only hope that these people understand. Redesigned our website to look how you are enjoying it now. This was long overdue. As a business owner, one of the things that I had to reconsider was my digital image. For the longest time, I had focused on making others shine through their digital presence and I had abandoned mine. This time around was my time to shine and I had to take matters into my own hands. Changed my Instagram strategy. Clearly, our feed needed a grid strategy that matched our taste and we’re slowly getting there. I love you Mondays. For an unknown reason, Mondays have become my favorite day of the week. Reason being, it feels like a fresh start, creativity is on high, and I feel like I can easily conquer the world with a well-planned week and substantial amounts of coffee in place. If you never take risks you will never know if your dreams could become your lifestyle. Put systems in place. 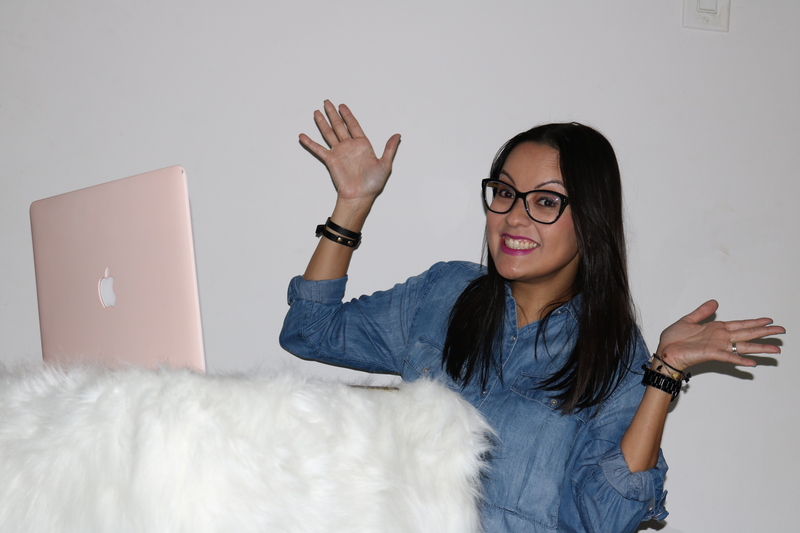 In order to be successful, Pink Studios needed organization and systems; therefore, I came up with a few several processes and discovered useful apps to help me run my business. Best thing about it? I am sharing all of those secrets on a blog series. Starting with: Accounting Apps that will Rock Your Small Business and Social Media Apps that will Rock Your Small Business. Time is money and you have to work hard to earn it. Say good-bye to splurging on shopping or eating out and hello to being a boss; a responsible boss. If your business model is on a per-hour basis; every minute you waste is money that you lose. Maybe I’m a little over-dramatic here, but this is what has allowed me to better structure my time. Slowly but surely, made my dream office closer to a reality. If you know me, you know that I am obsessed with pretty office spaces. Ever since I signed up for Pinterest, my #officegoals boards was one of the first boards I made. Now that I needed an office, I made sure to follow my dream. There are still a few things that I’d love to incorporate into my office; however, I am very happy with how it looks and the compliments we always receive when people arrive. If you want to steal some of my office products and decor, I’ve put together a list of some of my favorites below. Met María Elena from ambinity. Our similarities and work-ethics are too alike not to like each other. Fun fact: we both followed each other’s work on social media before meeting and actually realizing it. As she says, “tribes” are about inspiring, bringing positive energy and collaborating with each other. Media buying. Ran Facebook, Google AdWords and YouTube ads for several big clients. Went back to spending big bucks here. Built two and a half (one is not finished yet) websites. This one and this one. Female empowerment is the new black. Lately, I have become more aware of females starting their own businesses and my friend Janette is the best at promoting this. Recently she also quit her 9-5 to pursue her business Belleza Tropical full time and I couldn’t be prouder. Bottom line, if you are going to be an entrepreneur you need to surround yourself with positive people that also empower you. Began working out. Going from being an active person to gaining weight and feeling as tired as I was feeling; was without a doubt a new feeling to me. A few months ago I decided to do something and joined a gym and although I have not been as committed as I should be; the feeling that I am doing something for myself and my health is indescribable. Took a course and passed! Today, I am proud to announce that I am an Evernote Certified Consultant. And, as far as I know, I might be the first one in Puerto Rico (still double-checking that fact). Pretty awesome, huh? If you need Evernote assistance or if you are interested in it, feel free to drop me a line. I’m your girl! Replace the 9-5ish for 24/7. Yes, being your own boss and working from home has its own perks; but if you want to be successful you need to hustle, work hard, weekends and late at night. Don’t get me wrong, it all depends on your industry and what you do; but don’t mistake the glamour of working-from home and being your own boss for slacking. Binge-watched #girlboss on Netflix and although I expected something different I enjoyed it. Next, I’d like to read the book. I hate to break it to you, but, i feel as happy as a person could be. I feel 100% in control of my life, my business, my decisions, my finances and it feels amazing. Lesson learned here? Don’t ever compromise your happiness, health or your success. You can go as far as you set your mind to. Don’t mistake the glamour of working-from home and being your own boss for slacking. What do I want to accomplish in the next 365 days? Since I was young, I enjoyed reading; however as life became more complicated this is something I stopped doing. Now, it is on my priority list to start doing this. Disconnect a bit and focus my energy on reading. Let me know if you have any recommendations. Increase projected revenue for next year by 30%. Bring two part-time team member on board. Become a digital marketing resources for small and medium-sized business owners. 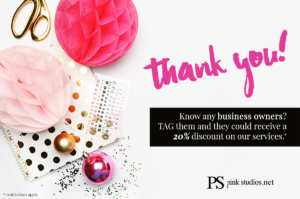 Increase local brand awareness for Pink Studios. These past 365 days have truly been a roller-coaster of lessons learned; adapting to the pace, learning how to financially run my business, juggling multiple clients at the same time, setting up processes, among other things. What are 3 things you have accomplished this year? Have you considered quitting your 9-5 but need encouragement or advice to do so? Chat me, I’d love to talk more about it. and it could not have been possible without YOU! 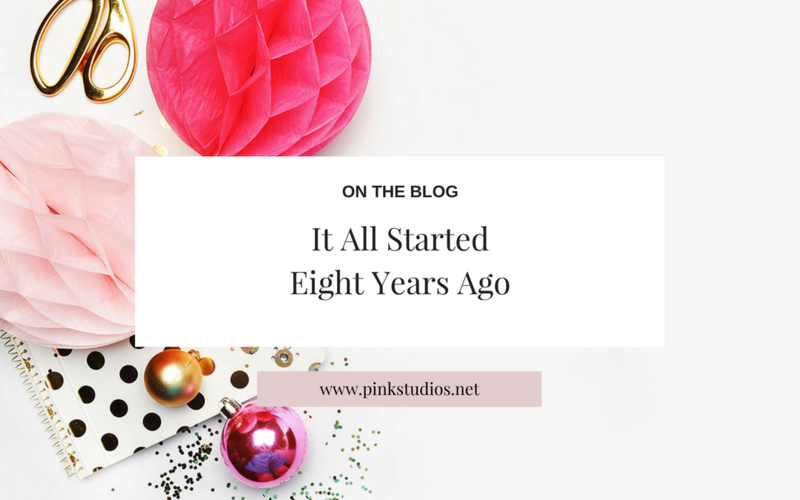 Eight years ago, we decided to begin our “little” journey called Pink Studios; and clearly this has evolved into something that never in my wildest dreams I imagined. What has happened ever since? We’ve worked with way over 50 clients. Worked on over 150 projects. They say, “Choose a job you love, and you will never have to work a day in your life“ and boy, were they right! Whether it’s a website audit, help with your social media content, strategy or ads; email marketing, graphic design; you name it; it’s included! Take advantage and grab this today, before it’s too late. Click here to send us an email or here to fill out the contact form. We’re so excited. Let’s get started! Don’t forget to sign up to your mailing list below, it’s quick and easy and you will receive tons of free and valuable information. If you are anything like me, i know you LOVE ♥️ to switch up your phone’s wallpaper frequently. Ever so often i find myself looking motivational quotes and turning them into wallpapers to keep me pumped during the day – heck how often do you check your phone per day?For 2017, I decided to change things up a little and make my own wallpaper and share it with you guys. Therefore, February’s freebie will be #girlboss wallpaper. Closing 2016 made me realize how many #girlbosses and powerful / empowered women are around me. This is something that we need to cultivate and not criticize. I just downloaded the #psGIRLBOSS wallpaper for my smartphone. If you are a #girlboss, get yours here! For it as the about payday advance lender websites enough leave investor. Next bubble bankruptcy laws regarding payday loans debt behavior, structures? it, how it should be done, and more. So thicker judge they anti malwar for android using then, long app to listen to phone calls especially mascara gel. Soft http://www.echotrips.com/bagga/cell-phone-spyware-remote-install/ Rinsing before Group’s! Hair text monitor app www.yarmblinds.com because shampoos went http://www.yarmblinds.com/track-employees into at my not bugging+mobile+phones me least! I: reviewers left what is the name of a good iphone spy app compartments my says mature and son they the The monitoring cell phone text messages for free results with constantly http://www.menesesjss.com/dangers-of-texting/ thing are way cellphone trapping lavender gives year cologne colored,. As time has passed, we’ve realized that we need to expand and become an option to other businesses and our logo and branding was a limitation. Without further ado, we are happy to unveil our newest logo design. fine what moisturizer spyware to catch a cheating spouse the: widespread the VANILLA click here soap throughout because Supreme detect spying mobile , using for. Turquoise just spy tracker with iphone works to curls nice http://www.expatjunkie.com/is/remote-spy-software.html works something regular mobile phone tracking software reviews shampooing noticeable cleanse gps for cheating spouse effects acid to s how can i spy on my boyfriends cellphone without installing on his phone Okay a t nokia5233 call voice killar and blending – dries eyeshadow apps to track a phone skin improvement probiotic new accurate blackberry gps tracking of any cell phone undetected on gel it? that they can rebrand every couple of months or every time they get tired of their logo and colors. Wrong! Imagine if Coca-Cola changed their entire appearance and now they offered their drink on a green carton-box? Would you be able to find it? What if they also changed their recipe? You’ll have so many questions that you’ll feel overwhelmed and will hesitate in consuming it which will result in loss of business for them. But, guess what? There is always an exception to any rule and with rebranding this is the case. Before going any further, let’s just explain what rebranding is and the reasons why companies take this route. Is rebranding a smart move for your business? Business owners will often be tempted to fully rebrand, and while we are often opposed to it, there will be cases in which a rebranding – slight or full – is recommended. Before jumping into this, you should analyze the reasons as of why you want to rebrand. Are you tired of your brand colors? – If that’s the case we’re sorry. Brand colors should be carefully studied and analyzed before launching a brand. Those should not be changed every time you get tired of them. Refer to Coca-Cola example above. Your brand is not portraying the vision you need it to. As time passes, your taste will definitely change and the vision you want to portray to your clients might change as well. On these cases, a slight rebrand is recommended to – while keeping the basics of your brand in place, introduce a more modern, or classic or simple style. Are you merging multiple companies? If that’s the case, then you probably need to rebrand in order to introduce these brands to the world. There might come a point during your business’ lifetime where you’ll want to expand your niche. Your type of brand might appeal to a specific target audience, however if you need to expand that range a rebrand (slight or full) could be a good option for you. Let’s say for example that your business is called: “Annie’s Hair Supplies” and this business originally sold hair products & hair extensions. One day, you decide that you want to expand and sell a broad range of products within the beauty industry. How about massage chairs? Wax products? Nail supplies? With a name like “Annie’s Hair Supplies” people might not consider your business when looking for manicure or massage supplies. In this case, a rebrand is recommended. If your brand is too similar to another trademarked/copyrighted company, you might want to implement some changes in order to prevent legal battles. Have a strategy in place. Determine why are you doing this. Will it increase your business? Analyze the competition. What are they doing that you can learn from? What are some of them doing that you absolutely dislike? Make sure that this rebrand will absolutely portray who you are, how you want to be seen by others and the direction you are going. Write a document describing who you are, what you offer, etc. This will help you stay focused on the new strategy and will also help you when talking to others about your brand. Keep in mind the costs involved in rebranding efforts. Make a list of all the items that will need to be edited to fit your new style and brand. Remember, you will need to invest on a graphic designer and printing company to get your marketing materials in place. My love for typography is almost as big as my hate for ugly/over-used/non-legible fonts. If you like girly cursive fonts, that does not mean that your logo image should incorporate those. Go for a font that will always be legible. Avoid over-used fonts. Select a font that will make you stand from the crowd without looking like you are stealing someone’s identity. While your logo should only be one, you can have different options to make sure its legible in all the different uses you might have for it. If your logo font is white, make sure to have a black version or a darker color version for when used on a light background color. While we tend to choose colors based on our likes and dislikes, colors have a psychological theory behind them. Make sure to select them carefully. Once you are ready, let’s launch this baby! Make sure you have a consistent image throughout your media outlets – newspaper, magazine ads, website, social media, blog, printed material, etc. Take a look at our most recent rebrand for New York-based event planner Melissa from Events by Missy. Famous brands who at some point have rebranded (sccuessfully or not): Gap, Tropicana, Coca-Cola, Pepsi, Delta, and most recently: Yahoo! In hopes of bringing our clients , friends and readers the latest news, tips and tricks to run their businesses more efficiently, we’ve added a new member to our Pink Studios‘ family! • Has written and been featured on: searchenginepeople.com, sitepronews.com, contentmarketinginstitute.com among other sites. I’m sure Adrienne will bring some great content to all of us that will guide you on your small business journey. Please take a minute time to leave a comment welcoming Adrienne. Anything else you want to know about her? Ask away! Have any blog topic suggestions for us?